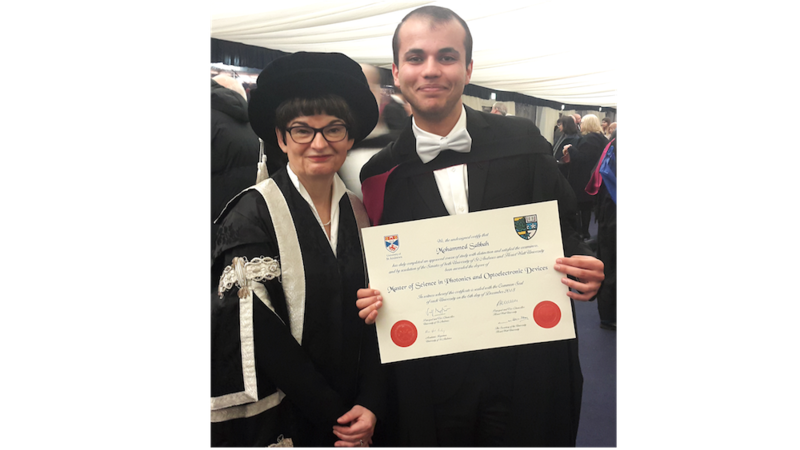 STEPS student graduates with a Master’s in Optoelectronics from St Andrews University. Mohammed is pictured here with Professor and Principal Sally Mapstone. He is now pursuing a Ph.D. at Heriot Watt University. That’s the short story. But what leads to success? Determination, risk-taking and intelligence. Mohammed was unable to leave Gaza to take up his STEPS scholarship in 2016. Rather than give up his dream to study optoelectronics at St Andrews, he enrolled in a computer course in Gaza. After studying at St Andrews in 2017-18, this unique combination of skills and knowledge helped him secure funding for his Ph.D. at Heriot Watt University.